At the ripe old age of who’s counting, I can’t hang for the midnight shows anymore. That said, World War Z would be an excellent movie to see at midnight on the opening night. Why? Because the movie is a total surprise. None of the upfront trailers give you sufficient idea about what to expect in the movie. I had a general idea that the movie was about some sort of apocalypse, but I had no idea how quickly I would be sucked into the action. The movie begins with a sweet vision into the mundane daily life of a family. On the news, there is some foreshadowing of danger, but that lasts for seemingly five minutes and, then, the movie becomes a rough and tumble ride to the finish. Okay, y’all already know that the movie is about zombies, right? I’ve spent five minutes trying to figure out how not to tell you that, but it isn’t a secret. Everything happens so fast that, afterwards, I realized that I couldn’t really tell you much about Brad Pitt’s acting. The movie is essentially the Bourne Identity with zombies, but you can remember Matt Damon’s acting in that movie? Despite his stellar body of work, I actually think Brad went with the Keanu Reeves less-is-more- playbook for this movie. I’ll let more studied critics decide whether this is accurate, but his acting was a little flat to me. So, the MVP award for the movie goes to the zombies. That’s a sentence I never thought I’d write. The zombies were creeeepy; the transformations happen so fast and the special effects take on a swarming, insect-like quality that will actually make you itch like you’ve seen maggots on rotting flesh. This is why I recommend going to see it in 3D, you need to feel the chaos in this movie. The 3D is very crisp, but still retains some grit and that’s why I liked it. I actually forgot that I was wearing 3D glasses. You know, in the hour that it has taken me to write this review, I’m quickly starting to feel less impressed with the plot as well. They could have done much more with the material. The trekkie in me always wants further exploration of political/social context, crosscultural communication and cooperation, and resolutions that don’t lead to bloodshed. I always wonder how a weak screenplay comes out of movies based on books, but, alas, I think this might be a case. My friend told me that the movie has nothing to do with the premise of the book. But, given all of these caveats, I think you’ll enjoy the movie. Hi Everyone! Welcome to my blog! I hope that you will enjoy my musings about the Star Trek Universe. I hope to infuse the blog with humor about life, dating, and other happenings relevant to all the lovers of the Trek. We are going to have some killer episode and movie reviews! If you hadn’t guessed already, wait for it… I’m black, word to Styles P. I rarely run into black trekkies with whom I can discuss the art of the Trek. Usually, it comes out in a hushed tone after I’ve figured out that I have encountered another potential nerd. Then, it turns into a trivia smorgasbord and discussions of who is the better captain. Let me say, I AM the best captain in my own mind, but I’ll be glad to listen to your thoughts. Who is Captain Jackson anyway? 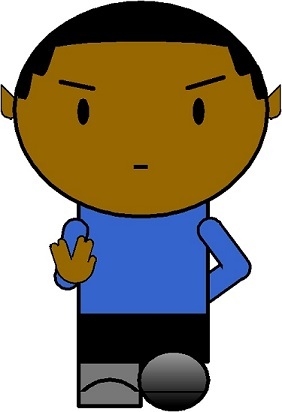 Captain Jackson, short for Captain Shante T’Pel Beyoncé Sisko Jackson, is the great grandchild of Uhura and Spock, after he stopped frontin’ on his feelings. It’s Hov. In all seriousness, I am native North Carolinian who stayed up way too late in her formative years trying to watch the Next Generation re-runs that came on before Rawhide. The Treks helped me dream about life beyond the hood and imagine a world without poverty. In my real life, I fight poverty on a daily basis and attempt to expand the horizons and provide educational opportunities for low-income youth. Blacktrekkie.com is born out of a need to find you, whoever you are, who can relate to my trekki-ness. It’s a place to dream and discuss about the Trek, the state of science fiction, physics, nerdiness, and why Levar Burton should get an Image award every year for Roots, Reading Rainbow, and keeping the Enterprise running despite being forced to wear a banana clip on his face, real talk. I know there are other black trekkies/nerds out there, maybe we can meet up one day. You don’t have to be black to enjoy this site, heck, we even have a penchant for green b*tches around these parts. All you need is a quick-witted sense of humor and geeky sensibilities. And, why should I care about black rights in space? -Because it’s the final frontier, mofo. Because Outkast said so. Neil deGrasse Tyson can’t do it all by himself. Dif-tor heh smusma (Live Long and Prosper) and please come back soon!